Peter and I celebrated a different kind of Valentine’s Day this year. 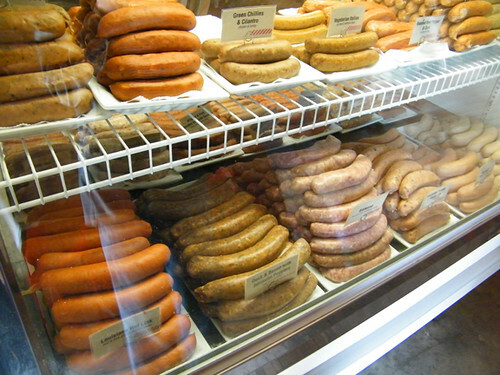 Instead of our usual fancy “schmancy” dinner out, we opted for an afternoon trek downtown to Wurstküche, the “Purveyor of Exotic Grilled Sausages”. Thinking there would be no traffic, we hopped on the 101 freeway a little before noon. What should have been a fifteen minute drive to Alameda street, took over an hour in the heavy traffic. I really hoped these exotic meats would be worth the trouble, especially since we skipped breakfast and were by then, really hungry. I wanted my wiener and I wanted it now! After we parked (conveniently right out front of Wurstküche Restaurant), we walked in and quickly went over the menu. 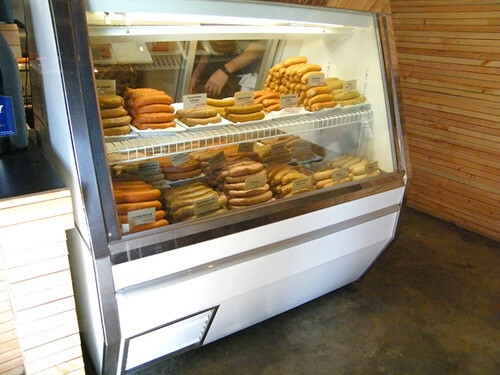 The sausages are broken down into three categories: “Classics”, “Gourmet” and “Exotics”. I ordered the Duck & Bacon with Jalapeno Pepper Sausage and Peter went for the Rattlesnake & Rabbit with Jalapeno Peppers (both from the “Exotics” list). 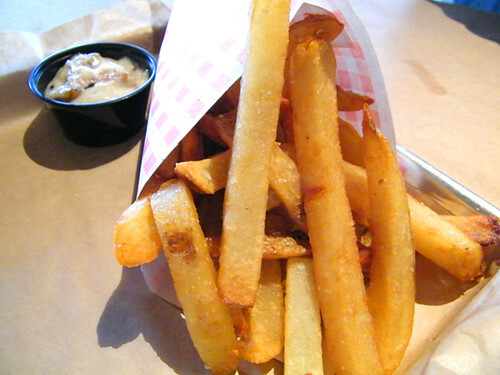 Along with sausages we also ordered Belgian Fries with Truffle Oil, which came with a dipping sauce. Choices were: Sweet and Sassy BBQ, Blue Cheese Walnut Bacon, Buttermilk Ranch, Thai Peanut, Tzatziki, Chipolte Ketchup, Sundried Tomato Mayo, Chipolte Mayo and Pesto Mayo. We selected the Blue Cheese Walnut Bacon. As we continued ordering, I looked around and was shocked at how small the restaurant was. There was bar seating in front of the order counter and kitchen, and two small bistro tables outside. 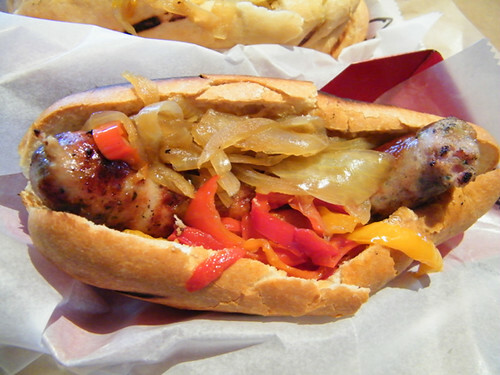 I’d heard great things about Wurstküche and wondered “where are all the eaters?”. Was I at the wrong place? Like most folks, Peter and I rarely drink alcohol during the day (unless we’re on vacation of course), but this being a Valentine’s lunch and all, we decided it was a must. The list of beers (draft and bottled) were a little intimidating because, honestly, we’re not really into beer, so basically we blindly chose one each. Both draft beers, I selected the Chimay White and Peter ordered the Houblan Chouffe which was an Indian Pale. While sipping our beers and waiting for our food, Peter noticed there were people coming from up the hallway. He asked one of the waiters where it led to and he motioned me to follow him. There we found a dining hall filled with smiling, happy people feasting on glistening sausages. The room was really large… probably 2,000 square feet, with communal tables and another bar along the back. A very relaxing “bier garten” indeed. Speaking of which, both of our beers were delicious. My Chimay White was crisp and a tiny bit bitter (in a good way). Peter’s beer (the Indian pale, Houblan Chouffe) was amazing. I kept sipping it trying to figure out the flavor I was tasting, and I swear there was a hint of passion fruit. Between the two sausages we shared, we both really loved the Duck, Bacon with Jalapeno and will definitely order that again and again. Next time we’ll have to try the Alligator & Pork or Green Chillies & Cilantro as well. Note: The Rattlesnake & Rabbit with Jalapeno Peppers was good, but the Duck, Bacon with Jalapeno was “make your eyes roll back in your head” good. Hooray, the food is here! Two groovy chairs in the back bier hall/dining room. Comfy but too low to eat at, so we moved to one of the communal tables. 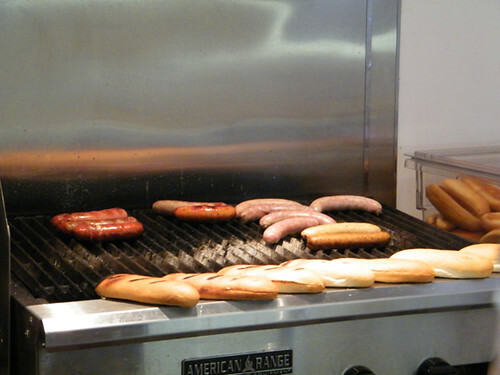 mmm… nothing beats the smell of wieners on a grill. On our way home the freeway was clogged (again) and pretty much a parking lot, so instead of trying to fight it we took the side streets. Driving along, every time we spotted a McDonalds, Peter and I started laughing because of the most recent episode of “30 Rock”. If you haven’t seen the “Valentines” episode then this won’t make sense to you, but we just had to stop and get a McFlurry! 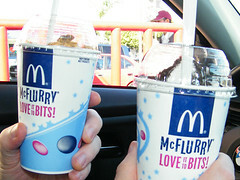 I hadn’t had a McFlurry in years… actually I’m not sure if I’ve ever had one. I definitely remember Dairy Queen Blizzards when I was younger, but this may have been my first McFlurry. I had the Oreo flavor and Peter had Snickers. It was definitely a sweet ending to our kooky, fun Valentine’s Day. Thanks Tina Fey! Who doesn’t love wiener time? This place sounds perfect for soaking up the booze, ya know? You guys amaze me with what you can find. What an outstanding sausage shop. 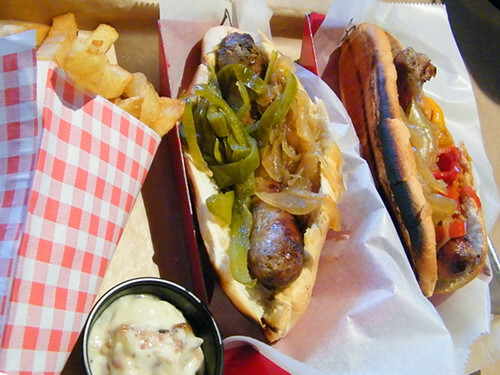 Rattlesnake and rabbit sausage — that’s what I’m talking about. What genius came up with that combination? It’s going to take me a long time to get to all of these places you mention, but some are slowly creeping to the top of my list. 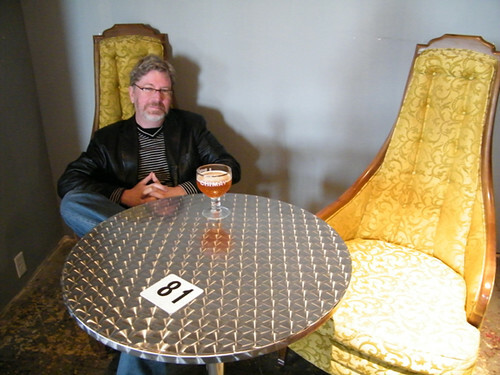 For not knowing much about beer, you picked two fine styles, and both classically Belgian. 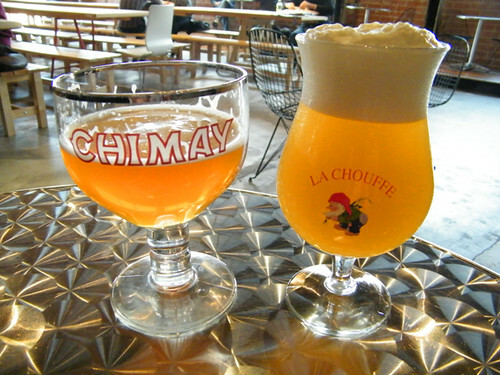 Both the La Chouffe IPA Tripel and Chimay White are fantastic and crisp, and I’m sure went very well with what you had, and helped cut through the spiciness of the Jalapeno. Great photos. 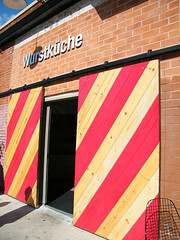 Wurstkuche is one, not my favorite casual restaurant in the downtown area. Very nice review. Sounds like a great Valentine’s Day. 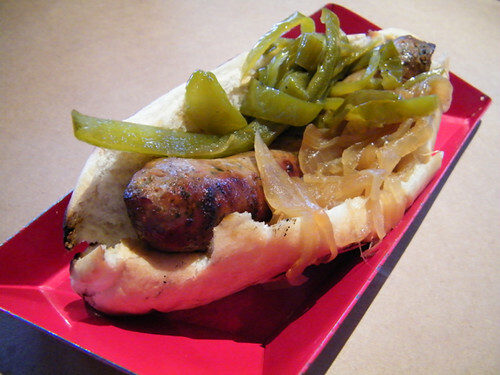 I had a nearly identical experience at Wurstkuche and would gladly repeat it. 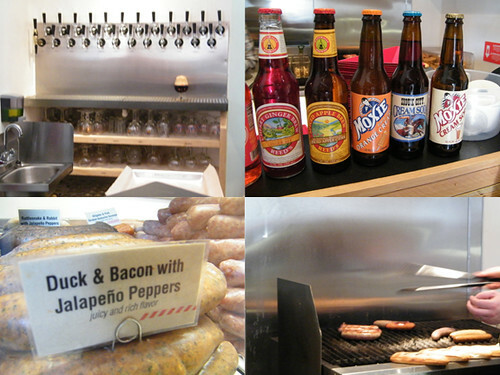 Great sausage and quite a good beer list! I must go here. These are two of my favorite things in one building. I went a couple weekends ago..DELICIOUS! Went to Wolfgang’s steakhouse and loved it. The room is beautiful, very New York. Not a scene like Mastro’s and the food was great. The bathroom is the best because the toilet seat heats up. That is insane and so hilarious. I’m hearing good things about Simon’s Cafe in Sherman Oaks. Maybe you should try it and report back???? I’m hearing so much about Rivera Restaurant downtown – have you tried it yet? Also, haven’t seen anything on BLT Steak. I’m hearing mixed reviews. Went to Simon’s cafe and it’s amazing. The food was fantastic. I enjoyed BLT Steak, and included it on a post called “The Paris I Never Knew” (about various bistro visits in L.A.). Here’s the link so you can check it out. I will also post it on it’s own page so it’s easier to find. Love Wurstekuche! Happy Valentine’s Day to you and Peter! i’m so glad wurstekuche is within walking distance for me! i love it there. my favorite weiner is the rabbit, pork, and veal with white wine. and i LOVE the bleu cheese dipping sauce for the fries! anything with bleu cheese makes me happy.